Leveraging hardware designed to support Dolby Vision, customers can expect a firmware update in early 2017 that brings Dolby Vision support to the player. 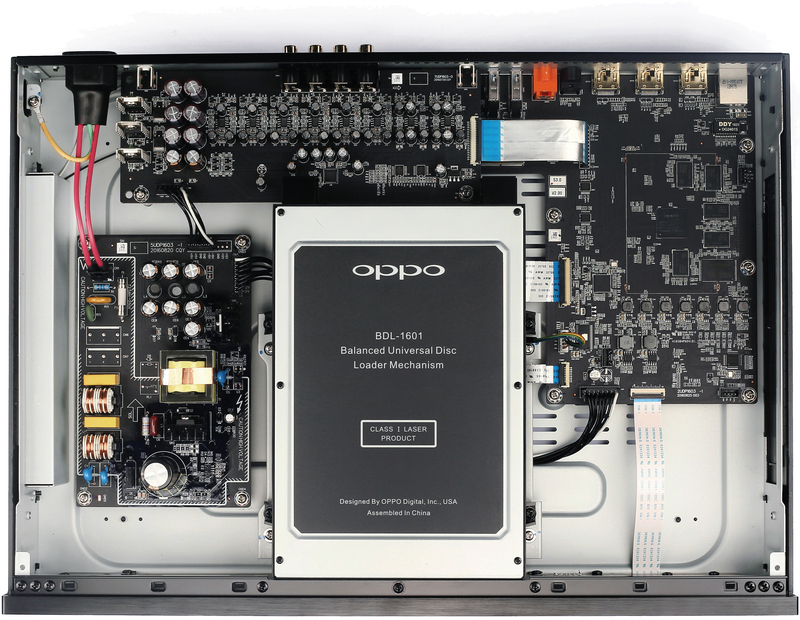 Dolby Vision transforms the TV viewing experience by delivering striking highlights, brilliant colors, and deep darks never before seen on standard television screens, and OPPO is committed to bringing this exciting technology to the UDP-203. Beta to Official. No other changes. Added support for the OPPO UDP-20X MediaControl app, which turns your mobile device into a remote that provides complete control over your OPPO 4K UHD Blu-ray player. Please select from the following device types to download the application: iPhone / iPad / iPod Touch, Android, Android (APK), Amazon App Store. Added Sharpness adjustment support for the 4K resolution..
For players with firmware version 42-0329 or earlier, please install the UDP20X-45-0605 firmware first. You will then be able to upgrade from version 45-0605 to the latest version, 46-0622. Added the “Track Type” descriptor when playing an SACD. Improved HDMI handshake stability when playing Dolby Vision content. Improved HDMI audio stability when using an HDMI Split A/V connection. Added the HDR 10 support for the HDMI in specs. An HDMI In Specs setting is also added to set the specifications and compatibility for the HDMI In port. Added the Gapless Playback setting in Setup Menu to set the gapless playback mode for music files. Added three Aspect Ratio modes - 21:9 Movable, 21:9 Fixed and 21:9 Cropped for the 21:9 screen users. Improved the compatibility with the Seagate hard drive. Added support for Roon. The UDP-203 and UDP-205 are now Roon Ready network players. Added HDR10 support for the HDMI input. An HDMI In Specs setting has also been added to the Setup Menu. Added the Gapless Playback setting in the Setup Menu to set the gapless playback mode for music files. Added support for the 21:9 aspect ratio for increased compatibility with 21:9 screen users. Improved compatibility with certain models of Seagate hard drives. Improved compatibility with Audirvana Plus. Minor update for improved Dolby Vision compatibility. Added support for MQA audio files on the UDP-205. Improved compatibility for non-standard 4:3 aspect ratio media files. Official Release of the 54-1108B Firmware. Resolved an issue where enabling 24p output and rewinding a DVD could cause the player to lockup. Resolved an issue where the PGS subtitles in MKV files would cause the player to lockup. 1. Download the latest firmware from the UDP-203 Support Website. 2. Insert a USB thumb drive into the computer that was used to download the UDP20x.bin file. Copy the UDP20x.bin file to the root/main directory of the USB drive. If the UDP20x.bin is placed into a folder on the drive, the player will not be able to detect it. 4. Turn on your OPPO player and other associated equipment (display, AV receiver, etc.). Ensure there is no disc in the player and that no USB device is connected to the player. 5. Insert the USB drive containing the firmware file into a USB port on the player's front or back panel. 8. DO NOT ATTEMPT TO TURN OFF THE PLAYER, UNPLUG THE POWER, OR PRESS ANY BUTTONS OTHER THAN NECESSARY TO RESPOND TO THE ON-SCREEN PROMPTS DURING THE REMAINING UPGRADE PROCESS. 9. After the upgrade is complete, the unit will turn itself off and then back on again. 10. Check the new firmware version by going to the Setup Menu, and then select Device Setup / Firmware Information. If you notice that the firmware versions displayed do not match the versions listed in this release note, please try another method or contact us. 11. We recommend resetting the player to factory defaults after upgrading the firmware. You can do so by going to the Setup Menu / Device Setup / Reset Factory Defaults. Re-enter your customized settings as necessary after resetting. 12. Congratulations! The firmware upgrade is complete. 2. Download the latest firmware from the UDP-203 Support Website. 3. Use your favorite disc burning software to burn a firmware disc from the downloaded disc image file. While doing this, make sure you are not creating a new data disc, but burning from the already-created ISO disc image. Please consult your disc burning software's help/instruction manual for more information on how to do this. Some general instruction for common disc burning software is listed below. 4. After the disc is burned, verify on the computer that the disc now contains a UDP20X.bin file. This is your firmware disc. 5. Turn on your OPPO player and other associated equipment (display, AV receiver, etc.) Ensure there is no disc in the player and that no USB device is connected to the player. 7. Follow the on-screen instructions to begin the firmware upgrade. The initial “Searching” process will take up to 2 minutes, and video output will be temporarily disabled once the upgrade is in progress. During this time, the front panel display of the player will show “UPGRADING”. 8. DO NOT ATTEMPT TO OPEN THE DISC TRAY, TURN OFF THE PLAYER, UNPLUG THE POWER, OR PRESS ANY BUTTONS OTHER THAN NECESSARY TO RESPOND TO THE ON-SCREEN PROMPTS DURING THE REMAINING UPGRADE PROCESS. 9. After the upgrade is complete, the unit will turn itself off and then back on again. Once you see the player’s Home Menu on your display, you may remove the upgrade disc from the player. 1. Turn on your OPPO player and other associated equipment (display, AV receiver, etc.). Make sure that the player is connected to the internet and the player is not playing any content. 3. Follow the on-screen instructions to begin the firmware upgrade. The video output will be temporarily disabled once the upgrade is in progress. During this time, the front panel display of the player will show “UPGRADING”. 4. DO NOT ATTEMPT TO TURN OFF THE PLAYER, UNPLUG THE POWER, OR PRESS ANY BUTTONS OTHER THAN NECESSARY TO RESPOND TO THE ON-SCREEN PROMPTS DURING THE REMAINING UPGRADE PROCESS. 5. After the upgrade is complete, the unit will turn itself off and then back on again. 6. Once you see the player’s Home Menu on your display, go to the Setup Menu and select Firmware Upgrade / Via Network in the Device Setup menu again and the player should report it already has the latest firmware. This will ensure that the player downloads and installs all parts of the firmware upgrade. 7. Check the new firmware version by going to the Setup Menu, and then select Device Setup / Firmware Information. If you notice that the firmware versions displayed do not match the versions listed in this release note, please try another method or contact us. 8. We recommend resetting the player to factory defaults after upgrading the firmware. You can do so by going to the Setup Menu / Device Setup / Reset Factory Defaults. Re-enter your customized settings as necessary after resetting. 9. Congratulations! The firmware upgrade is complete. Wendell R. Breland, guptown, gsr and 34 others like this. Last edited by Neuromancer; 03-10-2019 at 04:28 AM. gsr, oldsteve, Carter D and 21 others like this. Last edited by teachsac; 01-19-2017 at 01:37 PM. If you signed up for the UDP-203 Newsletter, then check your E-Mail Inbox. Santa may have delivered something early this year. I'll fill in this spot later. Too busy today. Beta Testers, NDA is over. PS. I am back. Hopefully better than ever. Or not. Thanks Neuromancer for starting this thread. Looking forward to discussions of this new beauty. And if not, this will become item #1 on my wishlist for future updates. So glad SDR BT2020 was included, I have a stack of UHD discs waiting on this puppy. srinivas1015 and EmyJ like this. MKV files with Atmos and DTS:X supported ? Hello, could any of the beta testers confirm if MKV files with Atmos and DTS:X work fine ? Also, do you know if the SuperDisc DVD region mod also works with this player ? gsr, DAB and smurraybhm like this. Does the player support FLAC streaming? Hey, about time your back Neuromancer. aaronwt, Carter D, pkeegan and 10 others like this. Last edited by JohnAV; 12-15-2016 at 11:17 AM. Atmos support in MKV: No (forced decoding of DTHD). DTS-X: yes. Please note that these are moving targets, as the BDA is really out to get MKV files now. Sam S and Adrienn like this. Last edited by rdgrimes; 12-12-2016 at 10:53 AM. Please note that complete lists of file type support will be available soon. In the mean time just assume that very little has changed since the BDP-103. And heading off another question: Gapless is working for .wav only at this time. FLAC gapless has a little tiny gap. but I know they are using a newer system for retrieving artwork and such, and it works better than Gracenote that is used in the 10x players. Can you output bitstream via HDMI and PCM via Toslink/PCM at the same time like the older players (93 and 103)? Just read the manual, looks like this is the case. turls and DocSid like this. Last edited by thxman; 12-12-2016 at 12:14 PM. Wish there was some info. on streaming apps on their page. Jive Turkey, woodhead2 and TomcatTLC like this. I love that the user manual says it supports SMB and NFS as well as DLNA. I never understood all the "smart" devices that would allow you to stream media from a USB stick, but didn't go the extra mile and allow you to stream the same media from a network file system. The only thing they seem to have neglected is HTTP streaming (at least I didn't notice that mentioned). pgwalsh and itallushrt like this. I am not an MKV afficionato, but I think the Superdisc still works. For release in the USA, Blu-ray will be locked to Region A and by default UHD BD is region free. I'm pretty sure no one knows anything about region free mod kits for BD yet. Me too, my projector is getting delivered tomorrow so I will be ready to go. No need for an Integral now I don't believe. Thanks for the info. I am behind since I do not own a BDP-103 as I will be upgrading from the BDP-93. According to the user manual, If watching an UHD blu ray and you turn HDR off, it will convert everything to SDR. I was hoping that one could still send WCG to tv from the 4K disc. No streaming apps (yet?). Only Oppo knows about any timeframe on that. that is on the player when released soon. You can. There will be an experimental "Strip Metadata" feature that will send WCG/SDR. A.Bell, wxman, Ted99 and 2 others like this. You can. There will be an experimental "Strip Metadata" feature that will will send WCG/SDR. great, replaces 900 + Fury, which I hoped. Why do you say "experimental "? Epson projection system, but perhaps it may not work perfectly with all setups (?). I can only report what I have experienced, and it works good for me. Ted99, gadgtfreek and dashcam88 like this. No streaming apps (yet). Only Oppo knows about any timeframe on that. I think it's pretty clear from their press release that there will be no built-in streaming apps. Ever. If you want streaming you'll have to do it through an external device. "In order to provide a premium user experience with quick start-up times and fast response, the UDP-203 is designed with a purist approach in mind for disc and file playback, and so it does not carry internet video and music streaming apps. Instead, an HDMI 2.0 input port that supports UHD resolution is available for users to connect an external streaming device. This approach affords users the flexibility to choose from a wide range of streaming devices and easily upgrade as streaming technologies evolve, while still taking advantage of the UDP-203’s audio and video processing capabilities." htwaits, Djoel, RLBURNSIDE and 2 others like this. You may be right. I only know what I have been privy to from Oppo, and they haven't talked about streaming apps. Only that they are not included on release. The HDMI input of the UDP-203 does accept 4K resolution on release, but not HDR. Oppo has said they hope to have HDR compatibility on the HDMI input in a future update. To confirm, when I try pushing my Roku Premier+ through the -203, I do get 4K but not HDR. Spizz, aaronwt, thxman and 4 others like this. That last bit is the only disappointing thing for me. I really wanted to send my Shield TV through the Oppo. I agree with their approach of letting dedicated streaming devices do that work wholeheartedly, but then that HDMI needs to be fully UHD ready, including HDR. That said, I still can't wait for it to show up and start enjoying UHD movies. Also really looking forward to comprehensive reviews from beta Testers. So no Netflix built in. Can you then hook up an Apple TV through the UDP-203.